PRINCE2 today is the de facto project management standard. The UK government in the 1980s demanded a solution to common project problems. They were struggling to deliver on time, under budget, within scope and up to quality. Like many private companies, they wanted a method focused on deliverables. While PRINCE2 was formalised by the UK government, it was inspired by a private sector framework. Simpact Systems Ltd developed PROMPT, which contained a system development module called PROMPT II. PROMPT stood for Project Resource Organisation Management and Planning Techniques. Simpact developed PROMPT in response to computer projects overrunning on time and budget. The UK government, looking for an IT project management method, licensed the use of PROMPT from Simpact. The Central Computer and Telecommunications Agency only fully implemented the PROMPT II module, and adjusted it to create a new standard. Like PROMPT II, it was meant for IT project management. Their variation of PROMPT II was named ‘PRINCE’ in April 1989. Originally, it stood for ‘PROMPT II IN the CCTA Environment’. Civil servants later changed the acronym to ‘PRojects IN Controlled Environments’. Changes from PROMPT II introduced Critical Path Analysis and project managers. PRINCE was released into the public domain in 1990, where it was more widely adopted. The UK government used it for major non-IT projects and it was taking hold in the private sector. However, the method had a reputation for being too rigid and unsuited to smaller projects. PRINCE2 was developed in consultation with about 150 European organisations. This virtual committee agreed on what they considered best practice. Along with the general framework of PRINCE, this advice formed PRINCE2. PRINCE2 is a generic project management framework, unlike PRINCE, which was designed for IT projects and adopted by other industries. To be suitable for every project, PRINCE2 has to be scaled down from PRINCE. For example, PRINCE demanded separate Business Assurance, Technical Assurance and User Assurance Coordinators. PRINCE2 doesn’t call for this because it’s too demanding for smaller projects. The global market responded well to this new framework. PRINCE2 retains its focus on the final product, but is more tailorable to different project environments. Because of this, PRINCE2 has become the de facto project management standard. PRINCE2 went through a number of revisions starting in 1998. In 2002, the international user community started consulting on PRINCE2 updates. The biggest revision, in 2009, made PRINCE2 more simple and customisable. The 2009 version also introduced the seven principles. PRINCE2’s 2013 ownership change to AXELOS Ltd led to PRINCE2 Agile. It’s thanks to the 2009 revision that PRINCE2 is now simple and light enough to make this newer course not just possible, but intuitive. AXELOS published its next major update in 2017. The new guidance focuses on scalability and flexibility. PRINCE2 from the beginning supported and encouraged tailoring. The 2017 update clarifies the bare minimum for a project to qualify as PRINCE2. It then shows examples, hints and tips about how to adjust these core principles to your project. Despite being major revisions, the name PRINCE2 hasn’t changed. Instead of referring to PRINCE3, ‘PRINCE2:2009 Refresh’ and ‘PRINCE2 2017 Update’ were chosen because the core principles behind PRINCE2 remain the same. PRINCE2, time-tested but updated, has proven its value over the decades. See the list of PRINCE2 courses we have on offer and you can be qualified in the de facto project management standard. For any questions or queries, please visit our contact page. 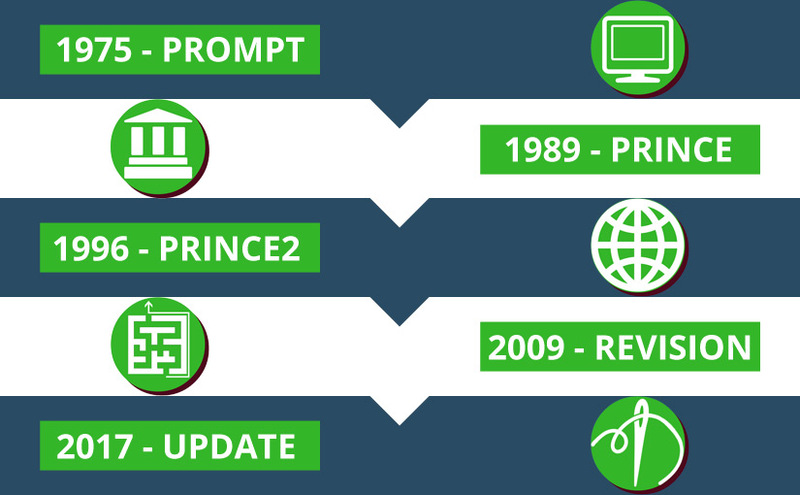 See the full history of PRINCE2 infographic here.